Use the elegant B 9 Side Tables Pure Materials individually or as a set. During his time at the Bauhaus Marcel Breuer experimented with steel and tubular steel as materials by logically translating the principles of furniture design appropriate for the material involved from wood to this new material. The proximity to the Junkers plant in Dessau was of enormous advantage. 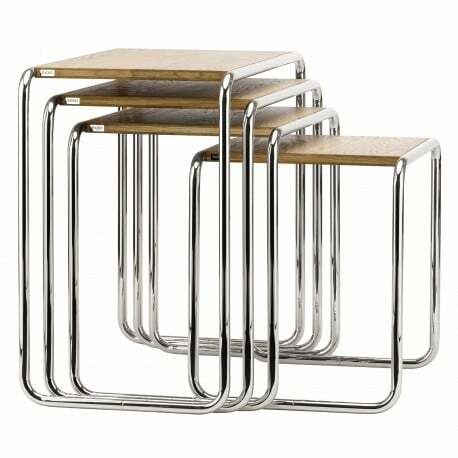 Among his first designs are the nesting tables B 9 used for example, in the cafeteria of Walter Gropius' Bauhaus building. Today, these elegant designs find their place in homes and the semi-public sector. 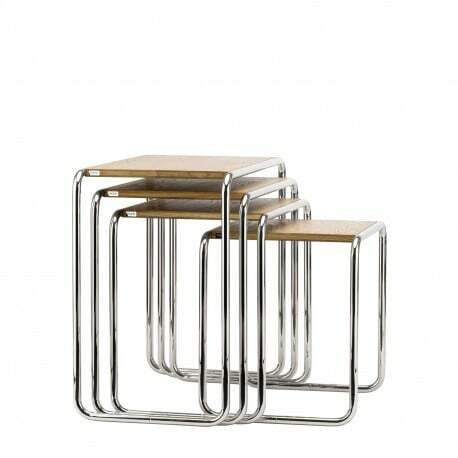 B 9 a-d: Side Tables in 4 different sizes, available individually or as a set. Pure Materials versions: with oiled oak and walnut, and nickel-plated frame.